For Homeless Families, Quick Exit From Shelters Is Only A Temporary Fix The rapid rehousing program provides the homeless with short-term rental assistance. But many recipients ultimately face the same problems as those who stay in shelters, a new government study finds. Jordan McClellan gets help making lunch from daughter Kyra Brooks in their apartment in Southeast Washington, D.C. McClellan has been fighting homelessness for most of her adult life, living in family shelters and transitional housing until she was moved into the rapid rehousing program. More than 150,000 U.S. families are homeless each year. The number has been going down, in part because of a program known as Rapid Re-Housing, which quickly moves families out of shelters and into homes. But new research by the Obama administration finds that for many families, rapid rehousing is only a temporary fix. It seemed like a good idea back in 2009 — when the recession had pushed thousands of families into homelessness. Rather than stay in shelters, families would get rental assistance for a few months — maybe a year — until they could get back on their feet. 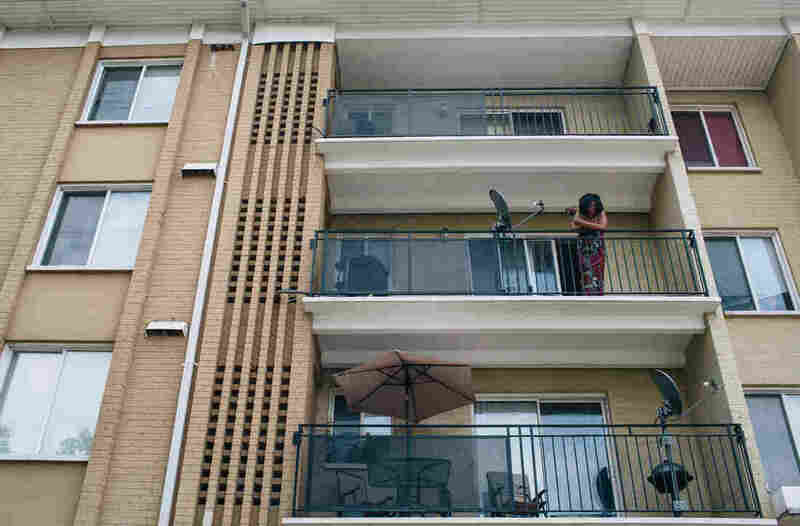 "What rapid rehousing did is say from the moment a family walks in, how can we get you out of here as quickly as possible and back into a home of your own," says Jennifer Ho, a senior adviser on housing and services at the U.S. Department of Housing and Urban Development. As part of the Economic Recovery Act, Congress approved about $1.5 billion for the program, making it a key tool for reducing family homelessness. But Ho says new research by HUD has raised some red flags. "Rapid rehousing is not a magic solution," she says. 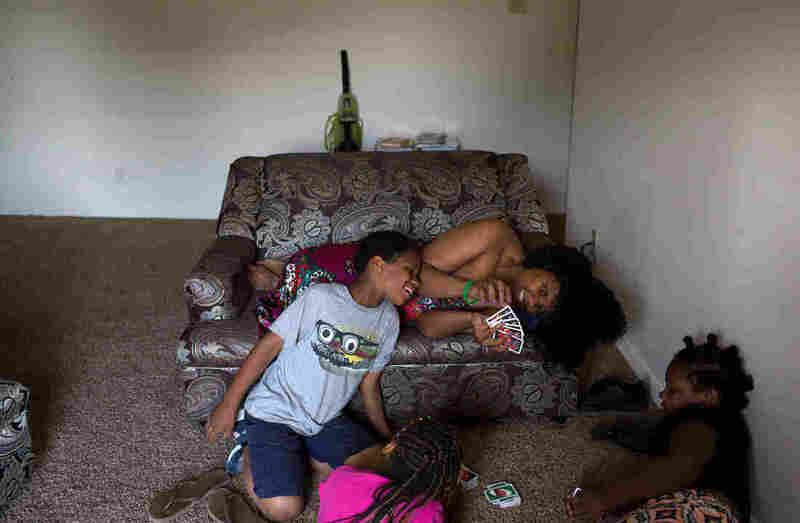 Her agency has found that families that get rapid rehousing are just as likely later on to face the same housing problems as families that stay in shelters: Many of them end up returning to a homeless shelter, doubling up with family and friends or moving from place to place. Jordan McClellan, a single mother of three in Washington, D.C., knows this all too well. She's gone from program to program, never getting far from the brink of homelessness. "There have been many days where I just wanted to give up," she says. "I felt nobody heard me, nobody cared." Kyra Brooks, 8, strokes her mother's head. After years in and out of various programs, McClellan finally received a permanent housing voucher for the apartment she and her three children live in now. That means she has to pay up to 30 percent of her income in rent, but there's no time limit, unlike in the rapid rehousing program. It began eight years ago when McClellan had two small children and was pregnant with her third. She lost her telemarketing job and was evicted from her apartment. As many families do, she went to live with a parent, but that didn't work out. So she moved into a homeless shelter for a year, then transitional housing where her rent was subsidized. When she got a job as a medical assistant, her subsidy went down. "And literally, the month that my rent went up, I lost my job," says McClellan. But the rent stayed high for several more months, leaving her in debt and facing eviction. Then McClellan was told she was moving to a new program called rapid rehousing. She became eligible for more rental aid, but it would last only a year. Then she'd be on her own. "The way the program is set up, every four months, your rent goes up 10 percent to get you by the end of that year in a place where you can pay the full market rent," McClellan says. "And mind you, market rent at my unit was $1,700." The assumption was that at the end of the program, McClellan would have a job. But instead, she had hip surgery and was unable to work. She says she was told she could get a three-month extension, "but that extension was contingent upon me having surgery on my other leg." McClellan knew the additional surgery would make it more difficult to get a job and be able to afford her own place. So McClellan sought help from the Washington Legal Clinic for the Homeless, where Marta Beresin is a staff attorney. Beresin says rapid rehousing is intended for families who face a short-term crisis, not those like McClellan who have a whole host of problems. 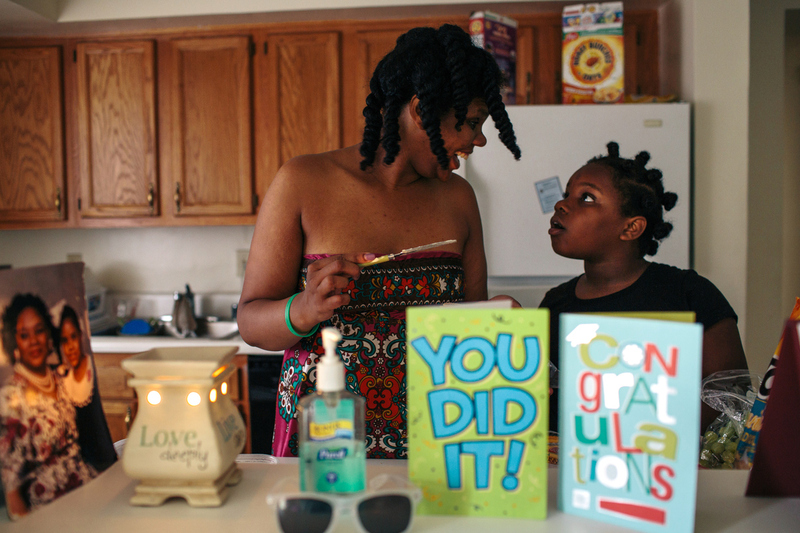 For some of Beresin's clients, rapid rehousing became more like rapid revolving door. "Oftentimes, families who had been doing everything they could to increase their income, and be able to afford the rent in their unit, but just weren't there yet, and they were being cut off, they're being evicted and they were coming back into shelter," the attorney says. Laura Zeilinger, Washington, D.C.'s new director of human services, says some of the complaints about the program are legitimate. In the past, she says, the city sometimes used rapid rehousing in a punitive way, as a stick to motivate families to get work, even though they clearly needed more help. She's trying to change that, Zeilinger says, "to really support families differently, to say we really believe in your potential to be able to make it in the long run and we are here with you to support you in doing so." This includes providing other services, such as job training and education, that people need to be able to afford their own place. But Zeilinger defends rapid rehousing. She says it's been a big success for many families and that it's more stable and less expensive than putting a family up in a shelter. HUD estimates that costs about $60,000 per family, per year. She and others in the field take issue with some of HUD's findings, noting that the study looks at only 12 communities, over a limited time period. And, Zeilinger says, there are few alternatives. Ho, of HUD, agrees that the goal is to improve rapid rehousing, not to replace it. In Jordan McClellan's case, things are looking up. She has just landed what almost everyone, including HUD, agrees is the best way to help homeless families. She has received a permanent housing voucher and in March was able to use it to get a new apartment. She has to pay up to 30 percent of her income in rent, but there's no time limit, so she finally has some stability. "You know it's a sense of security, like OK, I have a roof over my head, now I can focus on everything else," McClellan says. "Now I can focus on getting a job and, you know, moving forward in life." But the waiting lists for such vouchers are years, even decades long, in communities across the country. And no one expects Congress to fund more anytime soon, which is another reason rapid rehousing, and how it works, are getting a closer look.